Sharon and Georgina join Elva Norris, who has been with the company for nine years and Jennifer Johnson who has been part of the Worthing Coaches sales team for two years. Worthing Coaches has already begun adding to the fleet of holidays and excursions it offers, with 36 additional destinations in its newly launched winter brochure. The highlights of the new destinations include a Northern Dramas tour of the Emmerdale and Coronation Street sets; a Sparkling Ice Festival trip to Belgium, and a Mystery Tour to an unknown location in the UK. The additional holidays build on Worthing Coaches’ reputation for high quality trips both home and away. The high standards the company sets is reflected in its membership of the Guild of British Coach Operators and by being awarded the prestigious CoachMarque by the Confederation of Passenger Transport. CoachMarque is the only mark of quality for the coach industry, and requires the company to abide by the highest safety standards and systems of work to promote good quality travel, while Guild members are required to adhere to a list of stringent standards in order to retain their membership. For Georgina, the varied work Worthing Coaches does for its customers is one of the reasons she is enjoying her new role. She said: The team at Worthing Coaches have a great work ethic and are really committed to giving the customer what they need. 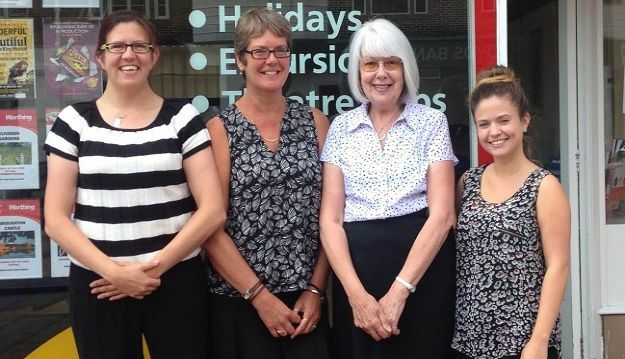 “I enjoy working with customers on the front line as no two days are ever the same.” Meet the new Worthing Coaches team at their George V Avenue office.